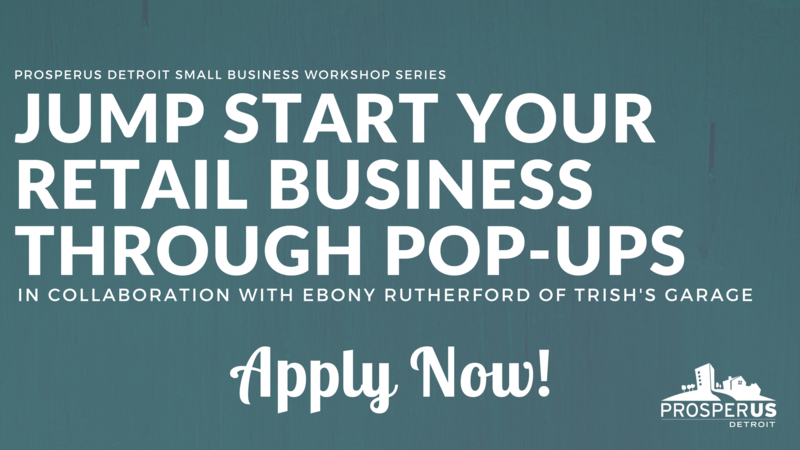 Thank you for your interest in ProsperUS Detroit’s new workshop series, a collaboration with Ebony Rutherford of Trish’s Garage. In this five-session course, serious retailers are encouraged to develop their merchandising, marketing, planning and customer service skill set with an experienced retail professional. Participants will become equipped with the necessary tools to start their own business or enhance an existing business through pop-ups. Each participant will develop one goal that will be applied through various assessment exercises. Participants will learn the different facets of event planning, merchandising, and will discover best practices for running and promoting a pop-up space. The workshop series will take place at Grand River WorkPlace (19120 Grand River Ave | Detroit). Is your business ready for that next step? Upon acceptance, the cost for the five-session workshop series is $100 made by money order or credit card to ProsperUS Detroit. Since there is only room for 12 participants, we must select each candidate with careful consideration based on application responses and business readiness. Applicants must have been involved with ProsperUS Detroit Entrepreneur Training Program -or- ProsperUS Detroit Loan recipient -or- ProsperUS Detroit Business Services recipient.